With the passing of Alan Rosen, I thought people might be interested in seeing these two articles about him. The first one is from the July 4, 1988 Sports Illustrated, when he was near the height of his influence and the late-80s card bubble was in full swing. This article used to be on SI's web site, but they took it down; however, it's still up on a baseball card blog (Uncle Doc's Card Closet) that posted the whole article, so I've linked to that. The second, shorter article, written by Bill Madden for the New York Daily News in 2012, depicts Rosen as down on his luck, desperately waiting for the phone to ring with somebody wanting to sell him their cards. A guy named Don in Greenwich, Conn., calls Mr. Mint in Montvale, N.J., and says he's got 3,000 to 5,000 baseball cards from 1949 to '52, mostly mint. Mr. Mint purrs, "Hmmm...."
"Mostly mint" is music to Mr. Mint's ears, which is why they call him Mr. Mint instead of Alan Rosen. But his past eight years of dealing mint '52 Mantles at up to $9,000 per Mickey have taught him to channel that first surge of excitement directly from his brain to his feet, which he does now, pacing back and forth at an aerobically beneficial tempo while keeping his voice as calm as that of a dentist preparing a skittish patient for root canal. "That's a lotta cards from the '50s," he tells Don, friendly, not too anxious. "Your mother didn't throw yours away, huh? So you're, like, an obsessive collector, huh? I understand." Enough small talk. "Here's my story, Don," Mr. Mint says. "I spend $4 million a year buying baseball cards. I am the leading dealer in the world—for mint condition. I pay 100% of the current retail price for pre-1968 sets and 70% for sets after 1968." Mr. Mint pauses discreetly to let Don ponder the thrill of dealing with the King of Cards, the Duke of Dough, the Sultan of Scratch, the Baron of Big Bucks, the Crowned Head of Lettuce, the Marquis de Wad—Mr. Mint. The Mint Man has emerged as a figure of near mythic proportions in a world suddenly gone mad over soaring baseball card prices. While shares of IBM have more or less sulked on the Big Board since the Oct. 19 stock market crash, august journals like The New York Times have reported the birth of a new blue-collar, blue-jeaned Wall Street, complete with its own Dow Jones-style industrial average, in '52 Topps Mickey Mantles (currently holding at $8,500) and '63 Pete Roses ($550), and its own volatile rookie card futures market in '83 Topps Darryl Strawberrys ($21-$28), '84 Fleer Dwight Goodens ($30-$60) and '87 Donruss Mark McGwires ($5-$8). An estimated 100,000 serious investors and millions of child arbitrageurs are pouring more than $200 million annually into baseball cards, autographs and assorted collectibles. In an ad in the May Baseball Cards magazine, Dave's Sportscards of Providence, R.I., advises the risk-tolerant investor to take a substantial position in $11.50 minor league 1980 Syracuse Chiefs card sets—"vastly underpriced and a great long term investment." Say what? Literally dozens of baseball card and autograph shows are now held every weekend throughout the country. Corporal punishment in the form of hand slapping has lately succeeded in eradicating the innocent childhood practice of flipping baseball cards to beat the other guy out of his stash. A damaged corner is fatal to the card's market value. Kills your growth portfolio like that. Any eight-year-old knows this. Guys in their 40's are suddenly rushing to their attics, digging out their old Jackie Robinsons and wondering how best to cash them in. Enter Mr. Mint, the nation's premier card maven. If this guy were any smoother, he'd be a lube job. Having given Don sufficient time to reflect, Mr. Mint tells him, "I would come to your place with a guidebook and a briefcase full of cash, Don. No credit. No checks. Cash. Remember, I need your cards more than you need my money. Prices are going wild right now. They're the highest they've ever been. Now is not the time to buy. Now is the time to sell." He pauses again. Somewhere inside Mr. Mint's head is the fastest pocket calculator in the world. "If your cards are near-mint to mint, Don, you're sitting on more than $25,000. I'll come up there with $35,000 in a briefcase. Hundred-dollar bills. You're laughing. You think I'm kidding you. I'm not kidding you. Give me 24 hours to get the money together. No one gets cheated. Everything is done in a businesslike manner." At the other end of the phone line Don stops laughing and suddenly talks sentiment with Mr. Mint. He talks baseball cards as his link to childhood, stuff like that. Something changes in Mr. Mint's face. He is no longer dealing. He's giving up on the guy. He's protecting himself against the heartfelt pain of a wimp-out, a deal gone south due to sentiment. "They're your cards," he says paternally, "and I understand you're attached to them." He stops pacing. He sits. He looks weary. Don asks if the raging bull market in baseball cards will continue. "I don't know, Don," Mr. Mint replies. "If I knew it would, I'd keep everything I buy. But I just don't know, Don." After he hangs up, Mr. Mint says, "He's got a major find, but he's very shaky. Says he'll call back in a while. We'll see." He won't, and Mr. Mint knows it. No deal. Time to move on. Deals are Mr. Mint's lifeblood. Sentiment is Mr. Mint's blood poisoning. He flashes back a couple of years to Gaithersburg, Md. He's leaving a baseball card shop, carrying his trademark briefcase full of C-notes, when someone named Frank, tall guy with a little goatee, walks up to him and says he's got complete mint sets from the '50s. Mr. Mint's meat. They drive to Frank's house, walk into his special card room. Mr. Mint likes what he sees, offers $15,700. Frank wants $16,500, agrees to take $16,100, asks when Mr. Mint wants to do the deal. Mr. Mint opens his briefcase, sees he's got $40,000 left, and says, "Now." Frank is clearly startled by this. He says, "Well, O.K., but I'd like to ask you for a special favor. Can I have five minutes alone with my cards?" Mr. Mint thinks this is a little unusual, but he leaves the guy alone in his card room. Five minutes later Frank emerges, sobbing gently. His wife comforts him, but he's crying uncontrollably now. He's bawling. "I can't do it," he says between sobs. "I've had them since I was a kid. I need the money, but I just can't do it." Mr. Mint closes his briefcase and leaves quietly. Mr. Mint has a love-hate relationship with sentiment. He opens a drawer now and removes a tiny, yellowed newspaper clipping describing the 11-1 Little League win over Ramsey, N.J., he pitched in July 1958. "Rosen went the distance," he reads, savoring the phrase, smiling, shaking his balding, darkly bearded, 42-year-old head. In those days, he says, the only thing he wanted to be in life was a pitcher. "I can't even move my arm anymore," he says sadly, demonstrating his damaged left wing. "Bad bone chips. I'm, like, orthopedic. My arm is curved." Once he lived for baseball. Now he lives for baseball card deals, because before deals there was no Mr. Mint. There was only Alan Rosen selling insurance, clothes, jewelry, typewriters, coins, antiques, whatever. Always hustling, trying to make a buck. Living in a small apartment in Hackensack, N.J., making 30, 40 thousand a year, spending 50, worrying about car payments, always behind the 8 ball, one step ahead of the bill collector. Then in 1979 he happened to stumble into a baseball card show, bought a '53 Topps Mickey Mantle for $100 (current price: $1,400) and, hey, call it fate, luck, the stars, whatever, his coin dealer's nose sniffed the future, and it smelled a whole lot like old baseball cards. By 1981 he was making $1,000 a week dealing mint cards from the '50s and '60s, which had just begun to explode in value. He found a Pennsylvania backer willing to put up 30 to 40 thousand in cash to buy out big collections at a significant discount. Then Rosen would break up the collections into smaller lots, tack on 20% and sell the lots to dealers. He became the merchant banker of baseball cards. A friend dubbed him Mr. Mint, and it stuck. No one else had his liquidity. No one else had his chutzpah. Have you found your old shoebox?/ Hidden for all these years?/ The one that held your treasures?/ That brought your eyes to tears?/ Did you ever think of selling these memories from your past?/ If you do, just remember: I always pay in cash. Those ads, Rosen says, made him. "I was loud. I was a braggart. This is abrasive advertising. This ad says I have money and I have the guts to go to a guy's house with $100,000 in a briefcase and walk out with a briefcase full of baseball cards. "Some people think I'm a schmuck. Let 'em. I'm no schmuck. I'm a buying machine. I'm negotiating for three major collections today. I did four million in sales last year. Spent three, took in four. At the rate I'm going, I'll do five million this year. I'm a multimillionaire and I flaunt it. Why? To impress people that I am for real." He is for real. Take the '52 Topps find valued at $400,000, for which Mr. Mint is famous. Truck driver calls from Boston in 1986, says he's just gone into his late father's attic and found a case of mint 1952 Topps cards. Mr. Mint says, "Yeah. Right. And I'm the tooth fairy." Guy says he's got a couple hundred cards plus two '52 Topps Mickey Mantles. Now he's got Mr. Mint's attention. The Mantles alone are worth $3,000 each. Guy calls back later, says he checked again and he's got six or seven of everything, including the Mantles. "I do some quick figuring and I know we're talking $100,000 worth of cards," Mr. Mint says rapidly. "I tell him I'm on my way." Mr. Mint puts $100,000 cash in his briefcase, flies to Boston and finds 50 to 60 of every card, numbers 193-407, including 57 of the $3,000 Mantles. Mr. Mint can't believe his eyes. Because the cards have been sealed for 35 years, their borders are blazing white and the Mick's teeth look like a toothpaste ad. "I'd never even seen one '52 Mantle in that condition," Mr. Mint says dramatically. "Here I had 50 of 'em in my hand. I couldn't control my emotions. I had, like, hot flashes. Of course, with that many cards, I couldn't pay him 70% of book. We had to discount more deeply. I paid him $80,000 for the case." On the way home, he remembers, he was ravaged by self-doubt: "I was torn. I had buyer's remorse, which is the feeling that you did the wrong thing. Did I buy too many? Would I get stuck for the money? What happens if the cards get wet? Or somebody steals 'em all? What if nobody gives a crap? I'm out $80,000. So do I sit on 'em and just sell a few at a time? Or do I blow 'em out?" He blew 'em out for $310,000, netting $230,000 clear, before taxes. Today, he says, those cards are worth more than a million. If he had held on to them, he could have made at least half a million. He sold the Mantles for $2,500 apiece. He recently bought one of them back for $7,000 and resold it for $9,000—quickly—always keeping his eye on the sure thing: cash. Why? "That cleaning lady you hear vacuuming up there," he says, "won't take a '69 Reggie Jackson [current value: $200] for cleaning the house. She wants cash." Listen, he says, he once had 12,000 of every 1984 card, including the Don Mattingly rookie card. Turned around and sold some of his Mattinglys for 59¢ each, then sold the rest for 99¢. Now, the card is worth $35. No regrets. Why? "I never had money before in my life," he says. "You know what it's like to make the money I'm making now on a lark? A card is not gold. It's not a coin. It's not legal tender. It's only paper. It's a lark. In my heart, I can't see sitting on 'em. I gotta blow 'em out." His 16-month-old son toddles in and is immediately introduced by Mr. Mint as Mr. Mint Jr. "We're going to Hawaii for a vacation," Mr. Mint says, "and I'm taking the baby-sitter along. It's gonna cost me $10,000. I can do that because of baseball cards. "New Year's Eve. I'm throwing a party for 50 of my friends. I'm hiring a hall, a caterer and Freddie Parris and the Satins. Another $10,000. I feel I'm giving something back to the hobby that got me where I am today." Which is sitting in Montvale in his $700,000 house. He drives three new cars, including a 'Vette. "I haven't read a book in 20 years," he admits. "I'm not smart. I'm not well-spoken. I'm a hustler. Where else is a guy like me gonna make $400,000 a year?" And what if it ends? "I can't see it falling to nothing," Mr. Mint says. "You can't create an old baseball card. Mickey Mantle cards went up and up and up. Now the market for them is a little soft. Your Musials, your Yastrzemskis, your Sniders, your Mayses, your Aarons are now catching up. Complete sets are going wild. "If this whole thing ended tomorrow, what else am I qualified to do? Maybe I'd be shining your shoes. Maybe you'd be telling me, 'Rosen, get me a cup of coffee.' I don't ever want to have to go back that way." Weekdays, he gives great phone and does buyouts. Weekends, he travels to card shows all over the country. Judging from the amount of money changing hands at a recent show he attended in Manhattan's huge St. Vartan Armenian Cathedral, Mr. Mint will not be shining shoes anytime soon. The cathedral is jumping with 2,300 card and autograph hunters doing business at 120 dealers' tables and lining up by the hundreds to get the autographs of Willie Mays and Stan Musial ($8 per signature), Duke Snider ($7), Warren Spahn and Juan Marichal ($6). One of the show's three coproducers, Stephen Hisler, an autograph expert, says that the Really Big Three—Mickey Mantle. Joe DiMaggio and Ted Williams—now command $15 per signature. At a show Hisler and his partners produced in late June at the Penta Hotel in New York City, Mantle autographs cost $15 per photo, $20 per ball and $30 per bat. Is there a ceiling to all this? Ts there a roof over Mount Everest? Hall of Famer Bill Dickey, a special project of Hisler's, is now up to the $12-per-autograph level. "When I started thinking about getting Bill Dickey for a show last year," Hisler says, "he had been ill for quite some time. He suffered blackouts. He was 80 years old. From a collector's point of view, he was a deceased autograph." Through the intercession of Barry Hal-per, a part owner of the New York Yankees, whose museum-sized baseball collection occupies an entire wing of his New Jersey home, Hisler was able to meet with Dickey at the Otesaga Hotel in Cooperstown, N.Y.
Hisler walked in. Dickey said hello, and Hisler almost lost it. "My knees were buckling," Hisler remembers. "I was shaking. I stuttered. 'M-M-Mister D-D-Dickey?' Now, you have to remember that we're talking about Lou Gehrig's roommate here. He was deceased, in my mind. I was thinking, This is a dead man talking to me. I felt like I was resurrecting somebody from the grave." At the Armenian cathedral show, some of the superstars look as if they are signing from the grave. Styles range from the coldly efficient Mays to the irrepressible Spahn, who flirts with the women ("God, you smell good! "), poses for photos with the kids ("Smile! Lemme see those teeth!") and comments from time to time on the nasal dimensions and Polish background of Stan Musial. who is listening at the next table. "Y' know," Spahn says philosophically, "I threw 50,000 balls in my career, and I bet I've signed 100,000. I'm making more this way. Collecting these things may be more lucrative than putting money in the bank. I've been fooling around with the stock market for maybe 25 years. If I broke even, I'm lucky. These things may be a better hedge against inflation." The scene at the Mays table is very different. Mays doesn't gossip with the fans. His accountant. Carl Kiesler, sits on his left. His accountant's wife. Iris, sits on his right. Mays signs quietly and quickly, rarely looking up. He is a volume guy, an autograph machine, a promoter's joy. He does not say hey or anything else. Signs right, holds left. Keep those baseballs coming. Roll 'em, roll 'em! Head 'em up! Move 'em out! Cowhide! Kiesler, who has represented Mays for the past 10 years, explains the economics of Willie's silence: "Our fee structure is such that we're not for everyone. Willie is in an elite category. In other words, expensive." Mays gets paid several thousand dollars per hour, and the promoters collect the $8-per-signature fees. The more Mays signs, the more the promoters make. He has no time to schmooze. "He'll sign 300 to 400 items per hour for three hours," Kiesler says. "After a while, his hand swells up and a knot forms in it. Fortunately, his name is not Ted Kluszewski. "Willie is sensitive to criticism. Fans stand in line for an hour, meet their idol for two seconds, then they're gone. Some just don't understand. This is business." Suddenly, Kiesler stops talking, tenses up, stares hard at the fourth guy in the autograph line. Always alert to anything that might hinder Mays's prodigious output. Kiesler thinks he has spotted trouble. Somebody who wants Mays to look at him, perhaps. The dreaded eye contact. Or worse. Somebody who wants to chat. "That guy's nervous," Kiesler says under his breath. "He's sweating. He's ready to fall apart. He's gonna be an aggressive schmuck when he gets up there. Maybe I'm wrong. Maybe he'll just fall apart quietly. But my guess is, he's a problem waiting to happen." A couple of minutes later the guy gets his stuff signed, says, "Thank you, Willie," and walks away quickly. Mays never even looks up. Kiesler takes a deep breath and eyeballs the rest of the line, ever-watchful, like a Doberman pinscher patrolling the grounds, nose to the wind. Unlike the unprecedented feeding frenzy in baseball cards, which is clearly profit driven, the autograph craze is apparently driven by sentiment—a guy thing, linking a man to his own childhood ghosts. Steve Sidransky helps work the Mays autograph line all afternoon in return for $100. which he immediately spends on yet another item to add to his collection of autographed baseballs. Sidransky is 38 years old. He is an autograph junkie. Ironically, Sidransky says he is not a hard-core baseball fan. "I'm not like 'Sorry, I can't go to the unveiling. The Mets are on.' I don't wear Yankee underwear. But this autograph thing is like a drug. It's out of control. Financially, it's a tremendous drain. It's never enough. It never ends." It's the nightmare of autograph addiction. The Mets win the '86 World Series, for instance, and Lenny Dykstra is signing autographs a half a mile away from Sidransky's Forest Hills apartment. He gets Dykstra, then figures he'll go to a show in the city, get a Mantle to go along with it. "Meeting Mickey was the greatest thing since my bar mitzvah," he says today, a year later. "And it ended up costing more, too." Sidransky, who sells rock memorabilia and concert shirts at flea markets to support himself and his autograph habit, has spent $10,000 on autographs in the past year and a half. "I live in a one-bedroom apartment. My building is going co-op and I need to come up with the money to buy a two-bedroom apartment because I need to make a baseball room. I want to get AstroTurf carpeting and a showcase for my 1,500 baseballs. But I'm stretched for cash. "I'm a maniac. I can't play my stereo because I've got baseballs all over the turntable. My whole refrigerator is so heavily magneted with upcoming shows that to get to the freezer you have to open the door very carefully or they'll all fall down." How did things get so out of hand so fast? "My father and I never went to a ball game together," Sidransky says sadly. "Not once. Mantle and the old Yankees should've been our father-and-son thing, our tradition. But we never went. We never played catch. We never even talked. "So I invented a memory. I created a past for us. It's like I want Mantle's autograph because it reminds me of the times my father and I used to watch him play in the Stadium. That never happened, but it should have. So it feels right, it seems American. See?" The long day at the card show slowly draws to a close. Sidransky drives his '79 Impala—the one with 90,000 miles on it—home to Forest Hills to figure out how he's going to afford that extra bedroom for his baseballs. Mays flies out of town on wings of silence. Mr. Mint returns to his home in Montvale, where, naturally, the phone rings in his inner sanctum. Guy named Mark wants to buy a case of baseball statues from Mr. Mint but balks at the $4,750 price tag. Mr. Mint is pacing at a goodly clip. And while he paces, he sets Mark straight: "I don't discount, Mark. These statues are white. Cream statues cost you $3,500. Yellow cost $2,000, maybe $1,500. But white is $4,750. We don't play the discount game where I say $5,500 and you say can't you do better and then I say $4,750 and you say fine. "These are near-mint to mint. No cracks, no dings, no chips, no broken arms, no broken noses. I'm talking quality. I don't sell junk, Mark. I hate junk. These are white. Not diaper white, but very nice white, very pleasing to the eye. Near-mint to mint. You think about it, O.K.?" He hangs up, still pacing. "In eight years I'll be 50," Mr. Mint says. "I can't believe it." The phone rings again. A guy's calling about renting a table at a big card show that Mr. Mint is coproducing with rock promoter Richard Nader. Darryl Strawberry and 13 other superstars will be there, autographing. More than 200 dealers will be selling collectibles. Mr. Mint wants to know what the guy's got to sell. Guy tells him 38 mint sets from the '50s. Mr. Mint does not hesitate. "Sure you don't want to sell them to me outright?" Mr. Mint asks. "Save you a trip? I hate to discourage the sale of a table at the show, but I could just come to your home with $100,000 in cash and buy them all. You're laughing. I'm serious. Here's my story...."
It is five o’clock in the afternoon and “Mr. Mint” is sitting at his desk in his office in Mahwah, N.J., looking longingly at the telephone. Alan Rosen, aka “Mr. Mint,” aka the “million dollar baseball card dealer,” aka “the buying machine” (as he variously describes himself on his telephone voicemail) is the last of a dying breed of baseball card dealers who make house calls — trying to hang on in a business that, like so many other businesses, has gone the way of the Internet and the changing times and cultures in America. In his 1980s heyday, Rosen routinely did around $8 million in annual sales of baseball cards, achieving a high of $9 million in 1989. 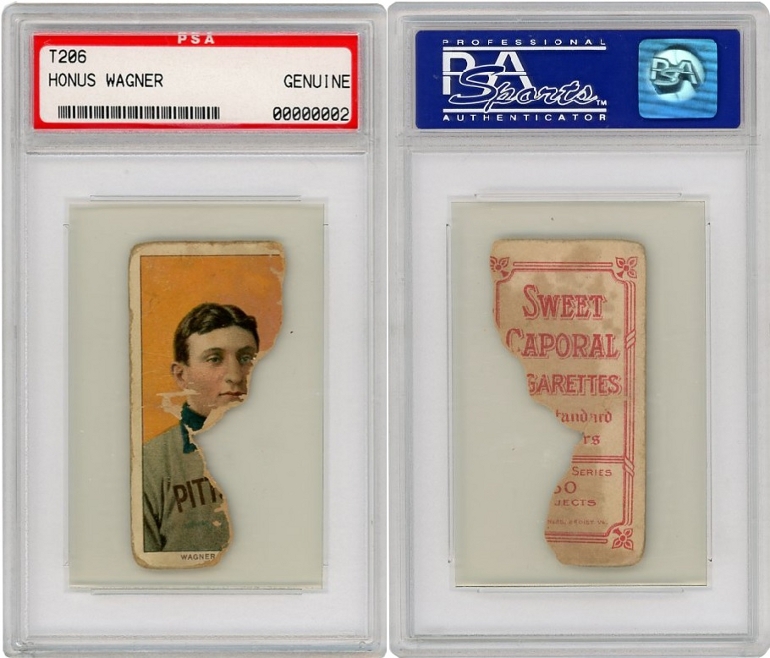 In his 34 years as the pre-eminent baseball card dealer, Rosen, 66, estimates he’s bought and sold over $200 million worth of cards, including the crème de la crème, ultra-rare T206 Honus Wagner (of which there are about 40 known to exist) eight separate times. “I think the longest I ever had a Wagner was about half a day,” Rosen said matter-of-factly. “To me, a Wagner is just like a cheeseburger or a pair of sneakers. It’s just merchandise. I even sold ‘half’ of the Wagner once. The card was literally torn in half. I saw it in a rare coin store and paid the guy $5,000 for it and then advertized it in Sports Collectors Digest as ‘half a loaf is better than none’. Sure enough, somebody paid me $10,000 for it! Lest Rosen gives the impression he has no feeling for baseball cards, he insists he still gets a rush every time he comes across a stash of mint or excellent-to-mint Topps cards from the 1950s, or Goudeys from the ’30s or Play Balls from the ’40s — which, sadly for him, is becoming a rarer and rarer occurrence. His all-time find remains the case of mint to near mint high number 1952 Topps cards he bought from a guy in New England in 1986 whose father had worked for the company. In 1952, the last series of Topps cards was not issued until September when all the kids had gone back to school and it was predominately available in the New York area. Years later, Topps officials reportedly took hundreds of cases of the unsold high numbers, one of which was the famed Mickey Mantle rookie card No. 311, on a barge and dumped them into the Atlantic Ocean. Leaving Rosen as pretty much the last “in-person” baseball card dealer — the guy who will still go anywhere with his briefcase full of cash — to buy cards. In that respect, Rosen is probably one of the few people we’ve ever known to beg us to put his phone number — 201-307-0700, and email mrmint@optonline,net — in the newspaper. I don't know about "down on his luck", it seems more like he was just jonesing for that "deal" fix. It's not easy for a lot of people to "retire" when they are still good at what they do and love what they do, but the field just dries up. Pity he couldn't have found a way to leverage his skills to moving gobs of junk wax....but I guess that is what Burbank is doing. Last edited by DaClyde; 01-27-2017 at 03:40 PM. the debunking has to do with David Kathmans excellent posts regarding early card dealers ie woody gelman. gelman was totally wired at the hip with topps and was selling 52 topps high numbers right out of the gate at a premium in the early 50's. no way they would have years later taken them out on a barge and thrown them in the ocean. i say it never happened and is merely a good story. another interesting insight is note the interviews posted on this site by david kathman: the 1988 interview of rosen he says he paid $80k for the 52 topps find, by 2012 it had grown to a payment of $125k. likwise rosen in the 88 article says he sold them for a total of $310k but by 2012 his memory now says they were sold in a matter of weeks for a total of $475k. what did rosen really pay and sell for, it does not matter but it highlights you can't take everything for gospel even if it comes from the person directly involved. especially if that person is a born salesman. by the way you should see the fish i caught when i was a kid!!!! as far as rosen finding a case of the 52 topps, absolutely happened. what he paid for them and sold them for is approximately what he says in two different printed news stories interviewing him. did topps ever toss out the 52 topps high numbers via a barge on a one way viking style funeral to the ocean, not a chance in my opinion. never happened but it is a great story. Last edited by jsq; 01-29-2017 at 12:41 PM. Anyone know the story behind the half of Wagner Rosen talks about? Has it sold since? Some strange stories/numbers for sure. I also no longer believe the high number 52's were dumped in the ocean based on that story you are referring to. I noticed the discrepancies too. Ol Alan was a flim-flam man to the end. Fun to watch but a bit cringe-worthy to deal with. Great couple of articles David. Is this the Wagner he sold as "better than having a half loaf of bread"? It's the only one pictured on http://t206resource.com/Wagner-Gallery.html that fits the description. Unless there's another half a Wagner floating around somewhere. I didn't realize that PSA Serial #00000002 was a Wagner as well. Maybe someone could post (trdcrdkid?) the original ad for us to compare, if it was pictured. Edit: I guess if you were going to have half a Wagner, it at least has his face and name. Last edited by swarmee; 01-29-2017 at 08:24 PM. Just ran the #00000002 Cert in the PSA database and it doesn't come up. So it must have been cracked out with the flip returned. Just looked that up and I agree, that must be it. I find it odd anyone would risk breaking that out. Must have an interesting back story. Anyone have any guesses as to what its fair market value would be now?